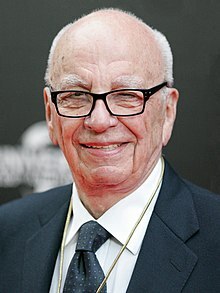 Rupert Keith Murdoch (born March 11, 1931) is an Australian-American media mogul. He became managing director for Australia-based network News Limited after his father Keith died. He is founder, Chairman and chief executive officer of global media network News Corporation (the world's second largest media group). His mother Elisabeth Murdoch died on December 5, 2012. ↑ Walker, Andrew (31 July 2002). "Rupert Murdoch: Bigger than Kane". British Broadcasting Corporation. Retrieved 27 December 2009. ↑ "Fortune". CNN. Retrieved 20 May 2010. ↑ "PowerPoint Presentation" (PDF). Retrieved 11 July 2011. This page was last changed on 1 April 2019, at 15:03.